Is it me or did this week fly by? Lately I feel like the weeks have been flying by, maybe because I been so busy prepping for vacation lol. I'm also super excited I'm going to back home this weekend to see my family and friends. NY/NJ here I come. I recently received this wide brim hat and I couldn't wait to style it. I love wide brim hats because they give a plain outfit a major boost. I went with an all black and denim mix. Remember the days I use to wear jeans that didn't have any holes in them... yeah me either, lol. I paired these ripped denim with a sheer black top. I love wearing tops like these at the beginning of summer because it's breathable and adds a light layer for a night summer breeze. The hat was the perfect accessory to finish the outfit. 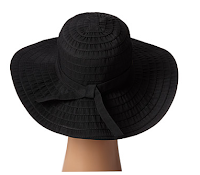 This hat from SCALA is perfect for summer you can say its a stylish protection from the sun. I love that it's crushable making it easy to pack. This baby is coming in my suitcase to Europe! They come in various colors, perfect for the summer. Hope you guys have an awesome Friday and weekend. Great look and you look amazing as usual, also in love with that hat. Now can we talk about these shoes please? Love me some chunky heels, these style are my new obsessions of the season.